All of my dolls have a story to tell, and this is one of my favorites: Hugo is from Norway, and he and his wife, Carolyn, were preparing to travel for Hugo’s mother’s birthday. They wanted to take her a special doll, but couldn’t decide on a look, so I was left on my own to create something unique and personal. I decided to make the doll rather old-fashioned, somewhat primitive yet pretty, based on what they had told me about Hugo’s mother. I used a pattern from Mother Earth and Me. After I had the doll mostly complete, I requested a picture of Hugo’s deceased father and put it inside a broach that I placed over some antique lace and positioned near the heart. I fashioned an antique hankie into an apron. As luck would have it, Hugo’s sister and her husband were here for a visit, so I was able to have both of them as well as Hugo and Carolyn sign the hankie—all in Norwegian. There were two other siblings, and Carolyn promised that once they reached Norway, she would have them sign too. Upon their return, Carolyn and Hugo reported that the doll was the hit of the birthday party, and his mother wept with joy. 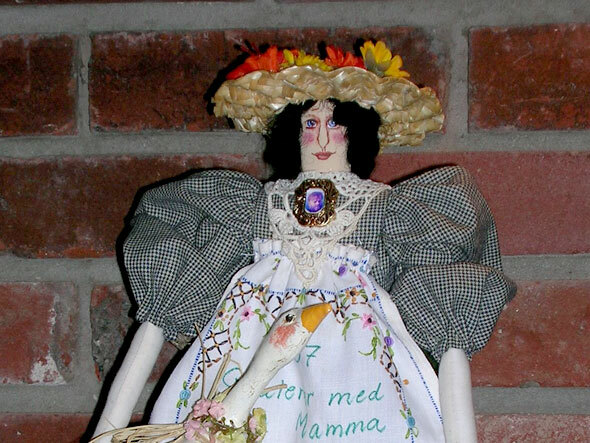 I feel connected to the woman who received this doll, and am honored that one of my babies traveled all the way to Norway to find a home. About the goose. Hugo’s family raises sheep, but I didn’t know how to make a sheep. So I made a goose. I used crackle medium to give it an antique look, and I hear it was loved as much as if it had been a sheep.